One of the most recurring questions thrown at Tutubi by his friends is how to get to Tagaytay by commuting i.e. using public transportation. He entertains most queries but this time, he'll just refer his friends here for the information. Before giving directions to Tagaytay, did you know the origin of Tagaytay's name? Tagaytay is actually an old Tagalog word for ridge, being a place on a ridge of an ancient caldera, similar to Taytay town in Rizal province that also sits on a ridge. Should you know anyone living in Tagaytay such a government official, please inform him/her that the Tagaytay legend of the "taga, Itay" is just not true and unfounded, something the people of Tagaytay falsely celebrate with a re-enactment during the Araw ng Tagaytay celebration on June 21. For a detailed street map of Tagaytay, please visit OpenStreetMap by clicking here. Map is centered on Tagaytay Rotonda. Option 1: via SLEX Sta. Rosa Exit, the most popular and easiest, is a straight drive all the way to Tagaytay Public Market (and right smack into Tagaytay Econo Inn) where you turn right going to Tagaytay city proper and Nasugbu/Balayan/Lemery Batangas or left going to People's Park in the Sky. Usual travel time from Makati CBD is just around one hour (except CBD traffic). Option 4: SLEX Southwoods exit then Governor's Drive in Carmona going to Dasmarinas. Turn left on Maguyam Road just before the Shell Station to your left. Option 5: via Aguinaldo Highway: Roxas Boulevard, Baclaran, Coastal Road, Bacoor, Imus, Dasmarinas via Aguinaldo Highway. Not recommended due to presence of heavy traffic made worse by SM Dasmarinas and Robinsons Palapala. 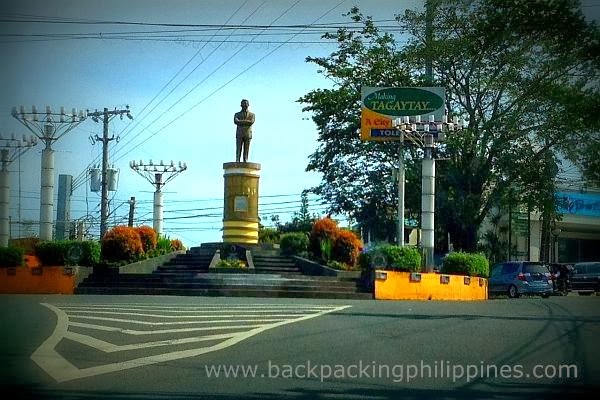 At the end of Aguinaldo Highway is the Tagaytay Rotonda (roundabout) where a statue of Ninoy Aquino, a BPI with ATM, Days Inn, Max's Restaurant and 7-Eleven store as landmarks. Option 6: Another route for the adventurous to Tagaytay is via Daang Hari that passes by Molino, Bacoor, Imus, Dasmarinas and Silang. It bypasses the traffic chokepoint of Bacoor rotonda but not SM Dasma and Robinsons. If you're going to Tagaytay via public transportation, request the driver to drop you off at your destination if along the way or at Tagaytay Rotonda (landmarks: Ninoy Aquino monument, BPI, Max's, 7-Eleven) where you can ride jeepneys or tricycle to your target place. from Navotas bus terminal via Malabon, Caloocan City, Quezon City via EDSA, Jasper Jean bus plies the Navotas to Pala-pala, Dasmarinas, Cavite route and pass by EDSA. (Those buses usually park to the detriment of other drivers) in front of Highway 54, Meralco Sub-station). In Dasmarinas, transfer to jeepneys going to Mendez, Cavite that pass by Tagaytay. Shuttle service (vans, FX, V-Hires) going to Nasugbu, Balayan and Lemery on Zamora Street near Metropoint mall and behind Kabayan Hotel near the corner of EDSA and Taft Avenue (accessible from LRT EDSA Station or MRT Taft Avenue station (EDSA Rotonda). Current fare is PhP180.00 (regardless of where you're going since it's a derecho trip). Travel time to Tagaytay from Pasay is around one hour and fifteen minutes. From Laguna to Tagaytay: In Pagsanjan Public Market, there are vans/fx/V-Hires going to Palapala in Dasmarinas Cavite. On reaching Pala-pala transport terminal (near Robinsons Dasmarinas and SM Dasma), transfer to a bus going to Tagaytay where it's less than an hour away. Calamba to Tagaytay: ride shuttle service at the public market beside Waltermart Calamba or at the Calamba Central Terminal. Cheaper alternative, ride a jeepney going to Balibago complex in Sta. Rosa then transfer to Tagaytay-bound jeepneys. Balibago to Tagaytay Public Market: Regular jeepneys plying the route to/from Balibago Transport terminal in Sta. Rosa Laguna to Tagaytay Public Market route. Crow Transit, Erjohn & Almark and Genesis have bus terminals at the corner Taft Ave & EDSA, behind Sogo Hotel and McDonalds, right below MRT Taft Avenue station and walking distance from LRT EDSA station. They have buses to Nasugbu/Calatagan/Balayan in Batangas or Alfonso, Cavite in regular schedules. San Agustin bus with signboard "Mendez-Tagaytay" from Harrison Plaza on Vito Cruz (Pablo Ocampo) or Araneta Center Bus terminal Baclaran (bus fare from Cubao is PhP114.00 travel time is around 3 hours) pass by Roxas Boulevard, Coastal Road, Aguinaldo Highway to the towns of Bacoor, Imus, Dasmarinas and Silang before reaching Tagaytay Rotonda then turns right going to Mendez, Cavite. Jeepneys going to People's Park in the Sky (indicated on the jeepney signage or emblazoned on the sides) at Olivarez Plaza near Tagaytay Rotonda will take you to People's Park in the Sky, Windy Ridge Hotel, Tagaytay Prime Residences, Franciscan Missionaries of Mary, Mahran Snack Inn (halal food for Muslims), FMM Retreat House, Lee Boutique, Aroma Tagaytay Apartelle, Iglesia ni Cristo, Jose Elementary School, Golden Rooms, Casa Luntian, Estancia Resort Hotel, Country Suites, House of the Holy Trinity, Sister Maria Carmela Bescia, Amoroma, Tagaytay Econo Hotel, Kaye Ryan Grill, Tagaytay Public Market (where you can catch jeepneys going to Balibago, Sta. Rosa), House of the Holy Trinity, Taal Monte Vista, Ina ng Laging Saklolo Parish, Keni Po Rooms, 5R Rooms for Rent, Fortune Duck Residence Inn, One Tagaytay Place, Tagaytay Elementary School (near Ligaya Drive where you can take jeepney to Talisay, Batangas), Tagaytay Science High School, Development Academy of the Philippines, Knights Ko Inn, Picnic Grove, Convent (Bahay Pastulan pasalubong, near Mary Ridge), Royal Taal Inn, T House, Japanese Friendship Garden, Tagaytay Gymnasium then to People's Park in the Sky besides among other interesting places to see in Tagaytay. Jeepneys with signboards Nasugbu or Mendez will take you to Mendez Junction that will pass by Hillcrest Plaza, New Orleans Hotel, Days Hotel, Tirona Hotel, Pamana Restaurant, The Theodore Hotel, The Boutique Bed and Breakfast, Our Lady of Lourdes Parish (Lourdes Drive), La Salette House of Prayer, Manos Greek Travel Hotel, Royal Parc Hotel and Restaurant, Radiant Star Apartelle, Canossa House of Spirituality, Tootsie's, Magallanes Square (Starbucks, Figaro, Leslie's Restaurant, Filibeans coffee shop, Max's, Cafe Lupe, Kitaro, LZM Lutong Bahay, Magallanes Square Hotel), Leslie's Restaurant, Filibeans, Carlos Pizza, Knuckles Bar, Rivera Hotel, Max's Restaurant, Yellow Cab, Cliffhouse Tagaytay, Fling Yoghurt, Buon Giorno, Elegant Star (near Maharlika Street), Petron gas station, The Lake Hotel, Belga Inn, Bistro Ibarra, Joyce's Diner, Joaquin's Bed and Breakfast, SM Wind Residences, Gerry's Grill, Josephines Restaurant, Summit Ridge Hotel, Robinsons, Giligans, Shakey's Pizza, Meralco/Tagaytay Power Station, Neul Borm Korean Restaurant, Tagaytay International Convention Center, Character Hotel, Fire Station, City College of Tagaytay, Casino Filipino (PAGCOR Casino), McDonalds, Sky Ranch (Sky Fun Amusement Park), Taal Vista Hotel, Antonio's Restaurant, Bag of Beans, Caleruega Church (after a tricycle ride), Evercrest Hotel, RSM Lutong Bahay Restaurant, Mijo Hotel, Josephine's Restaurant, Mushroom Burger and Mushroom Farm, Bali Village Hotel Resort and Spa, The Villa Hotel and Restaurant, Shell gas station, Petron, Allied Bank, Manukan Grille, Tides Grill and Bistro, Hotel Monticello, Villa San Jose, Taal Pink Hotel Apartelle, Nanay Dorie's Bulalohan, John Peter Bed and Breakfast, Belize Tagaytay, Country Sampler Inn, Sierra Spring Traveller's Inn, Mer-Ben Tapsilogan,Suspot Bulalohan,Balinsasayaw Restaurant, Viewsite Restaurant, Savemore, Mang Inasal, BDO, PNB, Security Bank, Jollibee, Tagaytay Haven Hotel, Mercury Drug, Starflower Tourist Lounge, Swiss Chalet, Bag of Beans, ATS Bulalohan, Tower Ground Bulalohan, Antonio's, A Taste of Honey, Sunview Inn, Breakfast at Antonio's, Residence Inn (with a mini-zoo), Marcia Adam's Restaurant, Villa Belus Subdivision, Andanita Taj Hotel (one of two earlier halal restaurants for Muslims, both closed now), Garden Hills, Luksuhin (where you can reach The Flower Farm Tagaytay and Paradizoo Theme Farm), Mountain Ridge, Potter's Ridge Hotel, The Roberts Inn, Hotel Dolores, , Tagaytay City Hall, Mahogany Market, 41st Division USAFFE site (beside Metro Tagaytay College of Business and Arts in Kaybagal South), Splendido Taal Golf and Country Club, Sonya's Garden, Canyon Woods Resort et al. Tricycles can also be hired in Tagaytay (taxis are not available) but usually charge fares much more than taking public utility jeepneys (PUJ) so be forewarned. thanks for this info. nga pala can i communicate with you thru email? i might consider going to calaguas. Very valuable info my friend. I'll bookmark this for future reference. I miss Tagaytay. i see nothing about negros occidental/dumaguete yet eh? your sites very informative, a great resource to those wanting to explore the philippines under budget. nice blog, been here for a couple of times already. I tried searching for dumaguete or oriental negros but didn't find any. try it here, there are a lot of good places here that are cost-effective. thank you for this nice post! actually all your posts are great! btw, is there a tricycle from the highway to caleruega? Hi. May I please ask how to go to Manaoag Chursh @ Tagaytay? As soon as I arrive to Tagaytay Rotonda? Thanks!! Very, very helpful. Complete info. do you know how much they charge? If you don't mind, can I ask a few questions? 1. Are there buses that use the SLEX route? 2. How to get to Bawai's Vietnamese Kusina (Brgy. Bukal, Silang, Cavite) from the rotonda? hi! We're going to tagaytay and will be staying at THE BOUTIQUE Bed and Breakfast... are the vans from mandaluyong pass by at THE BOUTIQUE? What are the possible trnaspo we could use so we won't get stuck in traffic at Coastal and Bacoor? And one more thing... How can we go to Starbucks from our accommodation at THE BOUTIQUE? Thanks! thanks for the quick reply sir tutubi! hmmm... if there are no buses using the SLEX route, how about vans? Alabang would be my best starting point but with the number of terminals there, I don't know where exactly to go. Also, can I ride buses going to Batangas there? sorry for asking too many questions. it's just that i'll be celebrating my anniversary in tagaytay next week and for some reasons, i have no choice but to commute. do know any hotels that accept walk-in guests just 4 overnights? And near puv terminals? Would you grant me permission to use some of these instructions in a blog I am preparing about a new retreat center about to open in Tagaytay? The place is just past DAP. Former street dwellers helped build it. I won't do a copy-paste but will adapt what you have written to the rather reflective tone of the blog. Forgot to tell you that your site will be properly acknowledged. anonymous, i don't think there are jeepneys going to tagaytay highlands as it's a private development and you need referrals to enter the place. Is it safe to commute in Tagaytay? Are there many jeepneys in the town or is there a schedule? how much is the minimum fare from manila to tagaytay? I just want to ask how to get to residence inn zoo from the rotunda(bpi) via car?I mean what are the landmarks to watch out for. I just want to ask how to get to residence inn from the rotunda(bpi) via car?I mean what are the landmarks to watch out for. ung 150.00 sa vhires sa tapat ng starmall at present ba un?? o nung 2009 pa?? sa tagytay rotonda pa a ng baba?? o pdeng sa picnic grove na?? super thanks for this post! Its such a big help since i'm planning to have a short vacation in Tagaytay. Like the rest, I also commend you for posting directions going to Tagaytay via private and public transports. Anyway, I have some concerns. I'll be visiting Tagaytay this week. Particularly, I'll be heading to Joaquin's Bed&Breakfast, located @ Km. 58 Aquinaldo Highway, Tagatay City. Oh, would you happen to know this place? If I'm not mistaken, my way is the Nasugbu/Mendez route and that I should be riding Crow Liner bus. But just for clarification/suggestion, am I going towards the right direction? So, I should alight @ Rotonda, then ride a jeep or tricycle to reach my destination? Or would the bus actually passby the exact location of my travel? I know I wrote long and I sound like makulet, my apology though. I just want my trip to be smooth sailing. :) Thanks a bunch in advance! Good day! anonymous, the buses that pass by cavite via aguinaldo highway will pass by the bed and breakfast, you won't reach tagaytay rotonda. Hello, nice blog. i have concern about the bus from EDSA rotonda, is it an aircon bus charging php 83.00 going to Tagaytay rotonda? thanks in advance..
any updated inns / hotels for day trippers? One more thing i forgot to ask.. is there any fx/van from cubao area that go straight to Tagaytay? is there a van/revo for hire w/ driver right in tagaytay... we're planning to commute to tagaytay tpos rent n lang ng van kapag maglilibot na sa tagaytay..
anonymous, probably but commuting there against van rental from manila may be more expensive. do the math. Typical vans for rent to tagaytay is around P3500 including gas and toll fees. as usual, your blog is just amazing on infos about how to get around cheaply :) it's my go-to blog whenever im planning to travel coz ur tips are really useful, practical and updated.keep up the good work! 2nd time today your site has helped me greatly with public transportation info. Great help! Thanks! Is there anybody can tell me how to go in tagaytay via fx? I'm coming from manila Chinatown and my best option is coastal road. Wondering if Aguinaldo hiway is already passable. hello po! my husband and i were planning to visit bag of beans this coming valentines day, ask ko lang po if im from Bacoor how cAn we get there? my bus po bang pwedeng sakyan na dadaan don? 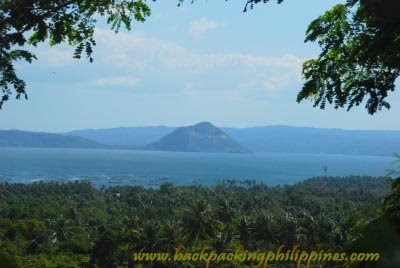 How to go to tagaytay mr. Backpack from lemery and how much? Hello mr. Backpacker...Good day,just want to ask how much po probably from lemery to tagaytay...by bus po ba or by jeep? Many hotels either don't promote online or provide insufficient information, thus letting your imagination fill in the blanks. Wala na pong cubao to tagaytay route? Thanks! Thank u so much for the info. Hope may maka bigay info for me. I,ll be going to sunrise holiday mansion hotel sa tagaytay. From naia airport 3 punta ko sa destination by bus. Pls any advise. Anong last trip ng bus pabalik manila? Got a bit confused because of the MMDA Integrated Terminal. Can I still take the bus near the Pasay/Taft MRT station? Will it take me straight to Tagaytay? hi! can you recommend some affordable places to stay in Tagaytay for a night or two? which is accessible for commuters like us? thanks in advance..
Hi. I noticed that the post was updated Jan 2014. May I know if taking the van at Starmall is a good option? I heard that they take a long time to leave. We will be coming from Boni MRT station. Our 2nd option would probably be the Crow Bus. Would you know how much it costs and how long the travel time is if we take this bus? I just wanted to ask, are there any buses rom Cubao na straight from Tagaytay na ang trip ? or I still need to go to Pasay para mas accessible yung pagcommute to Tagaytay ? So helpful. Many thanks for this blog ! hello sir. 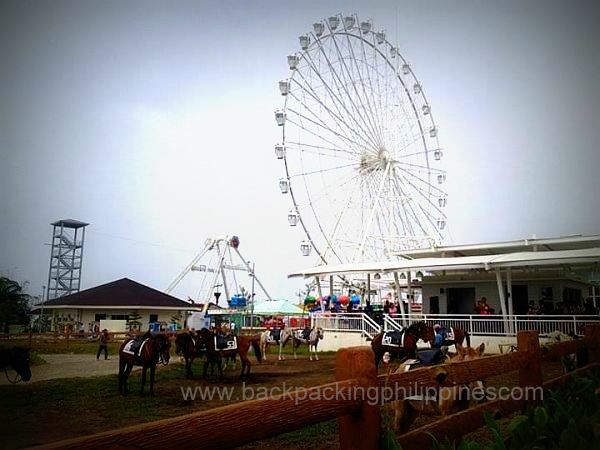 I'm planning to go on a trip this coming Sunday, June 8,2014 with my friend at Skyranch. I'm just a little bit confused how to get there by commuting from here at Quezon province...please help me. May I ask kung available pa ba yung Shuttle services sa may Starmall, and until what time kaya sila nagpapasakay? Hello ano po ba ang oras may bus sa tagaytay na papuntang baclaran? May 12pm po ba? How to commute from Lemery to Tagaytay? Hello there :) Just want to say thank you for your detailed post. Super helpful talaga sya sa mga readers. I'd also like to ask for your permission, I hope it's with you if I link your blogs to my blog? I really want to be as helpful and factual with my blogs as possible but there are times that I don't really know some stuffs, especially when it comes to directions and public commute. Nakakahiya I'm kinda slow when it comes to that, kahit anong turo ng hubby ko, I just can't remember sometimes :( I really hope it's ok with you. Here's my blog address: www.tinsestrella.wordpress.com. Like what izzalakwatsera said, just advise me if you're not comfortable with it. Thanks and all the best!!! medyo hndi na po updated ung bus transpo..galing po kmi gil puyat sa dltb bus terminal..160 na po hnggang nasugbu as of august 15 2015..pero thanks po sa info..
Hi... May bus pa ba papuntang manila at 7pm? Hi po... May bus pa kaya from tagaytay to manila (airport) at 7pm... Aabot ba kami sa flyt namin mga 10pm? Wow. Thanks for this! Jeep-trike-bus lang din ako sa tagaytay the last time i went there. Problema ko naman this time i'll be coming from nuvali (Night Sky Cinema!!) and gabi na byahe ko to tagaytay mga 9 or 10 pm siguro. May mga public transpo available pa po kya nun. Hi, from Batangas City, how to commute to Haven Tagaytay Hotel? Or Mendez tagaytay? Thanks. Appreciate the reply. How to commute to Arthur's Place in Tagaytay? Hi, I am residing at Nasugbu, Batangas. If you guys, don't want to pass thru traffic in Cavite. I will suggest to ride a van in Metromall (Im not sure with the name of the mall besides MRT). The route will be at SLEX via alabang and Sta Rosa. Last Saturday, it took me only 2 hours from Pasay to Nasugbu. Hope this helps. Hi Tutubi, can you pls add my Airbnb unit to your list of hotels/inns in Tagaytay?